» Blog » 2016 Jeep Wrangler with 30mpg EcoDiesel? The 2014 Jeep Grand Cherokee is setting America up for a diesel Wrangler as an option for the next generation, 2016 model year. While this “rumor” is all but confirmed, whether or not the Grand Cherokee is a success itself is still to be foreseen. After a 21% increase in Cherokee sales from 2011-2012 to a high of 155,000 units, the 2014 models experienced a price increase over 2013. This is a definite cause for concern as many consumers complain of Jeep’s fee hikes as pricing them out of the market. If or when the EcoDiesel comes to the US under the hood of a Wrangler, keep your eyes peeled for a decent price hike. The lingering question is – If the new Wrangler is offered with the EcoDiesel V-6 and comes with a significant price hike (say, $5,000), would you still buy one? 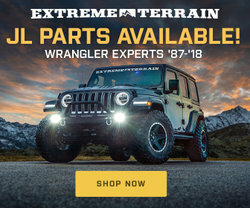 This post is based on the ExtremeTerrain.com Jeep Blog article.